A schematic diagram of the system studied is represented in Fig. 28.1. The system consists of a solar collector, a storage tank, an absorption chiller, heat exchanger, and auxiliary units. The system operates in four different modes. When solar energy is available for collection and there is a load demand, heat is supplied directly from the collector to the heating or cooling unit. When solar energy is available for collection and there is no heat or cooling demand, heat is stored in the storage unit. On the other hand, if solar energy is not available for collection and there is a load demand, storage then supplies heat to the heating or cooling unit. However, if storage temperature is not sufficient, the heating or cooling load is supplied by the auxiliary source. Fig. 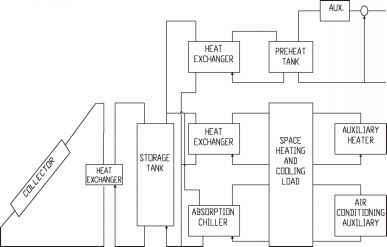 28.1 Schematic diagram of the solar heating and cooling system. 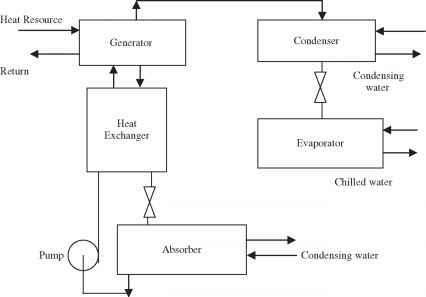 Figure 28.2 shows a schematic of the single-effect lithium bromide water absorption chiller. The main components of the absorption unit are generator, condenser, evaporator, absorber, and low-temperature heat exchanger. 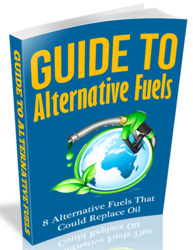 The lithium bromide solution is pumped from the absorber to the generator where the water is boiled off. The heat source is passed in a counter-flow arrangement through the generator to boil off water vapor from the LiBr-H2O solution. A cooling water loop is needed to condense the water vapor boiled off from the generator and to aid in the absorption of water vapor back into the LiBr-H2O solution. This cooling water is passed first through the absorber and then through the condenser. The evaporator takes in low-pressure cold water and produces a cooling effect by evaporating the water and passing it to the absorber. The chiller model is based on a commercially available LiBr-H2O absorption chiller system, Arkla model WF-36. The Arkla chiller has a nominal cooling capacity of 3 ton (37,980 kJ/h). Units of different capacity are approximated by scaling the Arkla performance. Hot water is supplied to the air conditioner at a temperature of 87°C (minimum), 93 °C (maximum), and leaves this unit 10°C cooler than the supply and returns to the storage (or to the auxiliary heater if storage is below 77°C). Whenever hot water from storage is cooler than 87°C, the auxiliary heat is supplied to raise its temperature to 87°C. When storage is cooler than 77°C, it is not used, and the auxiliary heater carries the full cooling load. The performance of air conditioning systems is expressed by their coefficient of performance (COP). COP determines how many units of cooling/heating one gets for every unit of energy he puts. Fig. 28.2 Schematic diagram of the single-effect lithium bromide-water absorption chiller. Table 28.1 Control Strategy for Room Thermostat. The coefficient of performance (COP) and the ratio of actual cooling capacity to the rated capacity f) depend on the generator temperature and the condensing water inlet temperature. Both COP and f are found from curve fits to the Arkla WF-36 performance. The cooling tower is modeled using a constant approach to ambient wet bulb temperature. 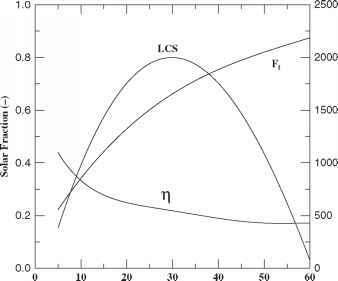 In addition, a constant COP model of a vapor compression air conditioner is included as a secondary cooling auxiliary so that the energy required to meet space cooling is provided even if the absorption machine cannot meet the full load. The control strategy and the multistage room thermostat used is shown in Table 28.1.